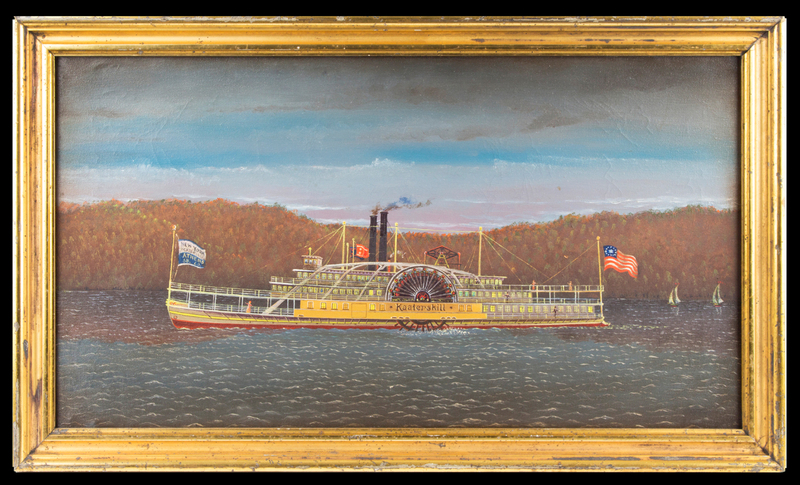 DON OLSON FINE AMERICAN ANTIQUES, Rochester, N.Y. earlypieces@aol.com 585-385-9002 Beautiful portrait of the Hudson River paddle wheel steamship Kaaterskill, oil on canvas, dating from the late Nineteenth Century. The Kaaterskill carried vacationers up and down the Hudson River to the Catskills. This painting shows the steamship on a lovely autumn day with passengers pictured on the decks happily taking in nature and nearby sail boats. The appealing colors are highlighted by the blue and white flag of the Athens Steamboat Company on the left, and the rich colors of the American flag on the right.